American purple gallinule Porphyrio martinica, copyright Carmelo López. 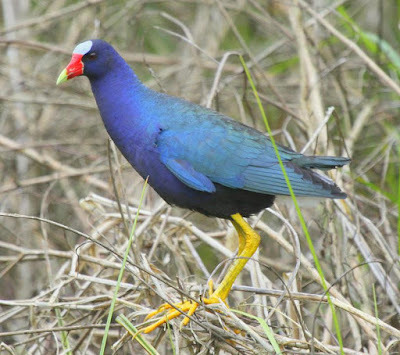 Porphyrio, the swamphens or gallinules, are a group of relatively large, heavy-bodied rails with generally blue or purple underparts and a well-developed frontal shield. [CC10] Checklist Committee (OSNZ). 2010. Checklist of the Birds of New Zealand, Norfolk and Macquarie Islands, and the Ross Dependency, Antarctica 4th ed. Ornithological Society of New Zealand and Te Papa Press: Wellington. [G-RGT14] Garcia-R, J. C., G. C. Gibb & S. A. Trewick. 2014. Deep global evolutionary radiation in birds: diversification and trait evolution in the cosmopolitan bird family Rallidae. Molecular Phylogenetics and Evolution 81: 96–108. [HSS13] Hirschfeld, E., A. Swash & R. Still. 2013. The World's Rarest Birds. Princeton University Press: Princeton (New Jersey). [JT12] Jetz, W., G. H. Thomas, J. B. Joy, K. Hartmann & A. Ø. Mooers. 2012. The global diversity of birds in space and time. Nature 491: 444–448. [L98] Livezey, B. C. 1998. A phylogenetic analysis of the Gruiformes (Aves) based on morphological characters, with an emphasis on the rails (Rallidae). Philosophical Transactions of the Royal Society of London Series B—Biological Sciences 353: 2077–2151. [L81] Long, J. L. 1981. Introduced Birds of the World: The worldwide history, distribution and influence of birds introduced to new environments. Reed: Sydney. [O87] Okamura, C. 1987. New facts: Homo and all Vertebrata were born simultaneously in the former Paleozoic in Japan. Original Report of the Okamura Fossil Laboratory 15: 347–573. [S13] Sarasin, F. 1913. Die Vögel Neu-Caledoniens und der Loyalty-Inseln. In: Sarasin, F., & J. Roux (eds) Nova Caledonia: Forschungen in Neu-Caledonian und auf den Loyalty-Inseln. A. Zoologie vol. 1 Heft I pp. 1–78, pl. 1–3. C. W. Kreidels Verlag: Wiesbaden. [SJ85] Storr, G. M., & R. E. Johnstone. 1985. Field Guide to the Birds of Western Australia 2nd ed. Western Australian Museum: Perth (Australia). [WS48] Whittell, H. M., & D. L. Serventy. 1948. A systematic list of the birds of Western Australia. Public Library, Museum and Art Gallery of Western Australia, Special Publication 1: 1–126. [WH02] Worthy, T. H., & R. N. Holdaway. 2002. The Lost World of the Moa: Prehistoric life of New Zealand. 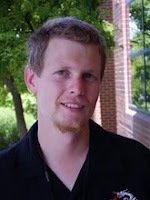 Indiana University Press: Bloomington (Indiana).